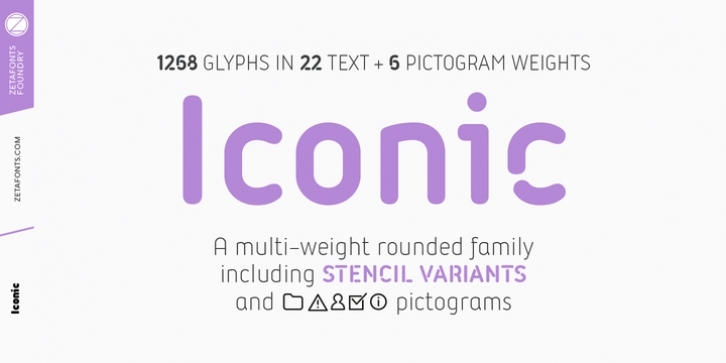 Iconic is a rounded condensed sans serif typeface designed by Andrea Tartarelli together with Cosimo Lorenzo Pancini and Francesco Canovaro at Zetafonts. It’s a multi-purpose workhorse family designed for clear and effective editorial, interface and information design with minimum usage of space. The soft, rounded shapes are all derived from basic circular geometry, but slight humanist touches have been added to make the family look more informal and readable. With his slim, minimal aesthetic, Iconic embodies the spirit of contemporary tech, and the desire for an effortless, natural digital experience. The extensive range of weights allows both for text and display usage. In body copy Iconic excels in clarity from light to bold with a choice of medium and regular for text appearance fine tuning; in display use it allows endless design expressions with a range that goes from the hairline thin weight to the super-fat heavy, all with matching italics. To complement the basic, regular shapes of the Iconic family, a Stencil subfamily has been designed with a more aggressive technical look. Perfect for wayfinding, branding and interaction design, the six Stencil weights can also be used next to the base family for a rich textural approach to type setting. Both Iconic and Iconic Stencil feature an extended character set of over 1200 glyphs that covers over 220 languages using the Latin alphabet, as well as Greek and Russian Cyrillic. Open type features include small caps, positional figures, alternate letter forms, stylistic sets, arrows and extra punctuation and discretionary ligatures. A six-weight icon set, Iconic Pictograms, has been also developed in matching weights to the base family to allow maximum control over the design of digital interfaces using Iconic.